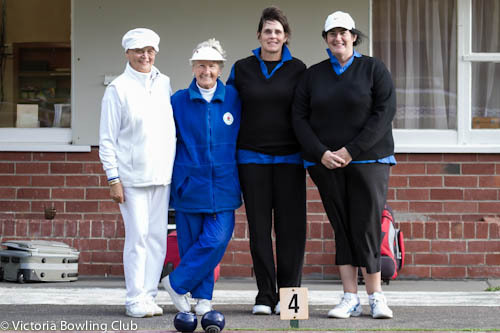 National pairs champion Serena Mathews (Canterbury) is back to defend her Speight’s Victoria Invitation 2-4-2 Pairs title but with a change of partners for the 2013 event this weekend. New Zealand Under-18 rep Tayla Bruce has replaced Sandra Keith from last year’s winning pair. Mathews and Bruce will encounter some tough competition to retain the title including 2011 champions Kirsten and Leigh Griffin (Victoria), 2009 winners Helen King (Victoria) and Karen Coombe (Canterbury), and the quality pairing of Luis Hare (Johnsonville) and Linda Ralph (Auckland) who face last year’s runner-ups Tui Opai (Lyall Bay) and Judy Howat (The Park) in the second match on Saturday. Updates can be found on our Invitation 2-4-2 Pairs page.